After 8 weeks in 13 cities our Journey summer school has come to and end with the final pitch day in the UK West Midlands. We take a look at how our last group of student’s got on. More than 220 students from over 45 countries, representing 50 disciplines, took part in this year’s Climate-KIC summer school – Europe’s largest climate change education programme. The Journey summer school is an introduction to the world of climate change entrepreneurship. The students learnt about making decisions, pushing boundaries, getting out of their comfort zone, improving performance and reinforcing their confidence. 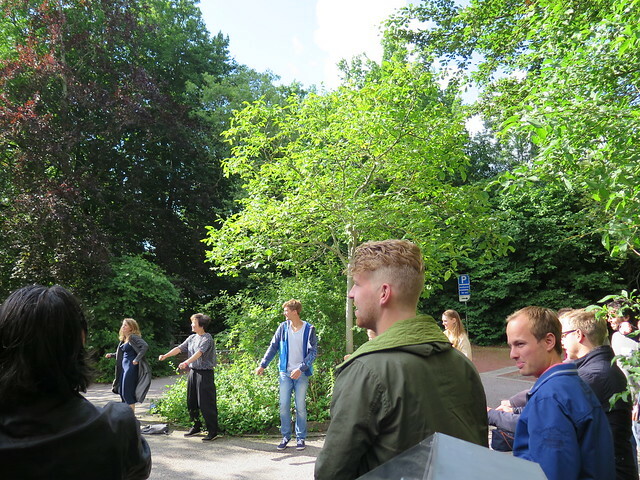 Set over 13 locations across Europe, this year’s programme is Climate-KIC’s largest summer school and was divided into six separate groups. Each group traveled to three different locations gaining insight and experience from a selection of Europe’s best universities and most innovative businesses. After an introduction into climate change and entrepreneurship the students teamed up to come up with a climate change business idea that they pitch in their final week. Yesterday (25 August) we saw the last set of groups pitch their business ideas to a jury in Warwick. With 73 students in 17 teams from the final 2 journey groups it was an action packed day of climate action innovations. Kicking off the day was FaBRICK who want turn cotton waste into insulation material. There was Sustainably Nuts who want to use Soap Nuts to provide natural washing services to hotels. StreetcAir received a huge round of applause for their proposed solution for air pollution for babies. Who knew that the most valuable fish in the sea was the humble sardine? Flarmy came up with an idea to replace eating fish with meals made of insect larvae. mPower proposed a power bank rental service for mobiles which also includes an energy donation to refugees. After a lunch break the Freedge team kicked things off with an energetic pitch about their idea for modular fridges for co-working spaces. Single use plastic bottles are a real problem for the environment. SoFlask came up with an idea for vending machines that can refill up your reusable flask with drinks instead of giving you a new bottle each time. NoTimeToWaste have an innovative solution to reusing Tetra Paks – making them into furniture! Team Pulp Kitchen are on a mission to stop food waste. Their idea? Turning food waste into Superpowders! The final team to take the stage was Power House , who brought a burst of energy into the final pitch with some African music. Their vision is to bring electricity to rural areas in Africa. There were three awards up for grabs; Best Idea, Best Pitch and Audience Award. The Best Pitch award went to Pulp Kitchen and Flarmy took home the Best Idea award. Both teams also won the Audience Award for their very successful pitches. This weekend the Journey students make their way home but that doesn’t mean their climate journey has to end. As Climate-KIC UK & Ireland Director explains, there are still plenty of opportunities for the students to get involved with Climate-KIC going forward like the Alumni, ClimateLaunchpad or Climathon. Check out the rest of the final week of the Journey as it happened on Twitter by following the #climatejourney16 hashtag on Twitter. On 28 October Climate-KIC are hosting the 2016 Climathon in 121 cities around the world. Cities set challenges related to climate change issues and participants have 24 hours to come together and develop ideas to solve the problems.